The gap between rich nations and emerging economies is closing. As a result, the global dynamics of innovation are changing. No longer will innovations traverse the globe in only one direction, from developed nations to developing ones. They will also flow in reverse. 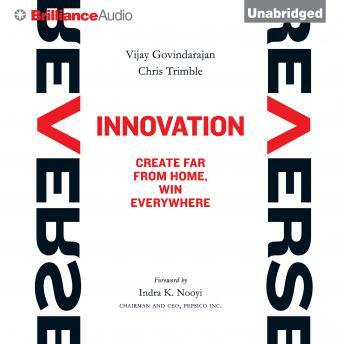 Authors Vijay Govindarajan and Chris Trimble of the Tuck School of Business at Dartmouth explain where, when, and why reverse innovation is on the rise, and why the implications are so profound - for nations, for companies, and for individuals. The authors focus in particular on a traditional pillar of rich-world economic vitality: successful and long-established multinational corporations. All are now seeking explosive growth in emerging economies, and all must learn new tricks in order to succeed. Reverse Innovation shows leaders and senior managers how to make innovation in emerging markets happen, and how such innovations can unlock opportunities throughout the world. The book highlights the tribulations and triumphs of some of the world's leading companies (including GE, Deere & Company, P&G, and PepsiCo), illustrating exactly what works and what does not. The new reality is that the future lies far from home. Whether you are a CEO, financier, strategist, marketer, scientist, engineer, national policymaker, or even a student forming your career aspirations, reverse innovation is a phenomenon you need to understand. This audiobook will help you do that.